OSAGE CITY — Wanda Langley hadn’t left her house in over three years. After losing her husband, two sons and a grandson all within about two years of each other, she cut herself off completely from the outside world. “I closed in on myself,” said Langley. “I wouldn’t even go outside and sit on the deck to be out in the fresh air for over three years. But then, quite suddenly, it was as if God was pouring his love down on Langley earlier this month. And that love took the shape of an invasion of teenagers from the Archdiocese of Kansas City in Kansas. 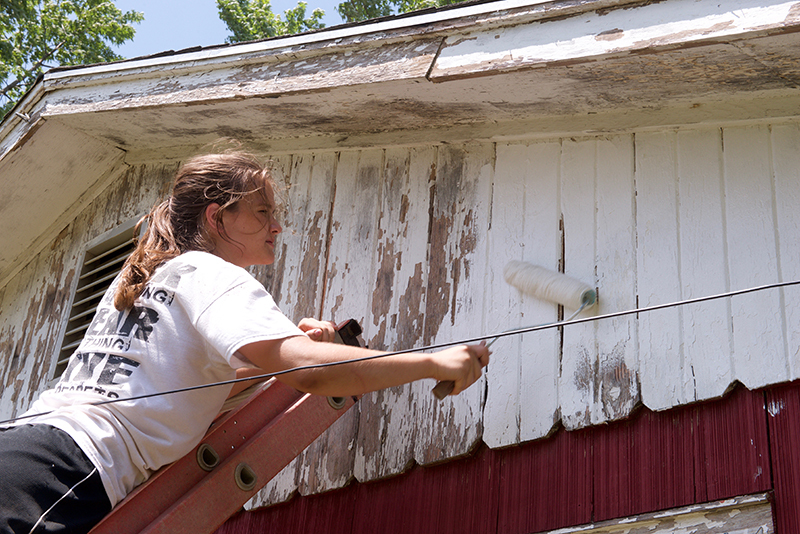 The high school students were participants in Prayer and Action, a mission trip program that reaches out to local homeowners in need of work done in and around their homes. “It’s intended to help high schoolers learn and embrace the idea that mission work is not just something in a foreign country, but that we have people in our own diocese, in our own communities, that need help,” said Ben Rogers, a seminarian for the archdiocese who is spending his summer with the program. “The second part is to try to help them establish a deeper relationship with their own faith and with Christ,” he continued. This is the third summer Rogers, who is entering Theology I this coming fall, has dedicated to Prayer and Action. This summer, he is working with two other seminarians, three young women and adult chaperones from area parishes for five weeks in Osage City. “We rely on the local community to help us identify the people that need help and we have an application process,” said Rogers. The group also relies on the community for food, supplies and a place to sleep. Father Larry Bowers, pastor of the St. Patrick churches in Osage City and Scranton, is a big help and serves as the group’s host pastor. Father Bowers says Mass for the volunteers every morning, joins in on the work when he can and hosts the boy volunteers at his rectory. The homeowners are often elderly, disabled or, in some cases, families with a father away in the military. A different team of high school kids and chaperones show up each week and are sent out to the homes to paint, clean, garden and do any other work that needs to be done. But more than that, they work to build relationships with the homeowners. Tricia Hart, a chaperone from Prince of Peace Church in Olathe, said she was fortunate that her group was paired with Langley. “It was so gratifying to be with her,” she said. After being cooped up in her house for well over a thousand days, Langley felt like God finally sent her a sign when her neighbor signed her up for Prayer and Action and the young people from the archdiocese showed up at her door. Since the kids came to work on her house, Langley has been outside on her deck every day. “I’ve even got a sunburn [so] I can prove that I was outside,” she said. Hart was surprised by how quickly her group connected with Langley. “It was wonderful to see how positive [the kids] felt about how they could impact someone so powerfully, but so easily,” she said. “And yet, they could see that in one day, Wanda was walking in her yard. They were like, ‘We did it!’ It was just that little ripple, and the impact was amazing,” she said. One of the reasons Langley never stepped outside was because she was ashamed of her yard, which her husband had always kept in perfect condition. The people who were supposed to take care of her yard, she said, came up with excuses not to whack weeds or take care of it fully. “Those kids went out there and I am absolutely ecstatic about how beautiful the yard looks,” she said, holding back tears. “I just didn’t believe that I would ever see my husband’s yard look as beautiful as it does now,” she added. The group was also able to paint the backside of Langley’s house and part of the garage, as well as put new boards on the garage. Hart was amazed by the work ethic of her group. Everyone involved learned that even the smallest act of kindness can mean the world to someone who is dealing with a battle no one knows about. “I have praised the Lord,” said Langley, “thanking him for sending those children here to do this for me. For more information on the Prayer and Action program, visit the website at www.archkck.org/prayerandactionkc.